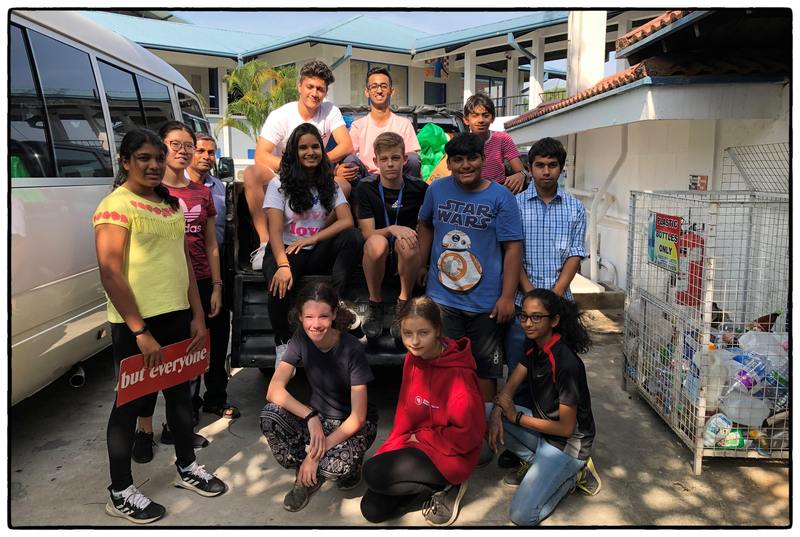 OSC’s Recycling & Sustainability semester 1 group before the first collection of 2019. OSC’s Recycling & Sustainability group is starting the 2nd part of the school year’ service session this week. We have a group of veteran participants, all of who have worked with us at some point in the past. To continue working to reduce the school’s ecological footprint on campus with a special focus on solid waste reduction and separation. To run an informative and produce OSC Environment Day on March 12th while also supporting the more globally focused Earth Day on April 24th. We are looking forward to working with other campus groups addressing sustainability (Reefkeepers etc.) in these endeavors. To work with the school maintenance team to ensure that the new Biogas Plant is properly maintained and fed. Over the winter holidays it was neglected and so we are having to recharge it with come dung to prepare it for taking in school foot waste. 2019 team collecting on February 14th Valentine’s day!. Dawoodbhoy, Zahara. “Colombo’s Unseen: Those Who Sweep Our Streets.” Roar Media. 29 January 2019. Web. “Plastic Recycling Project in Sri Lanka.” Roar Media. 13 December 2018. Web. Rubatheesan, Sandaran. “Concerns grow as report shows plastic killing off our fish.” Sunday Times. 10 February 2019. Web. 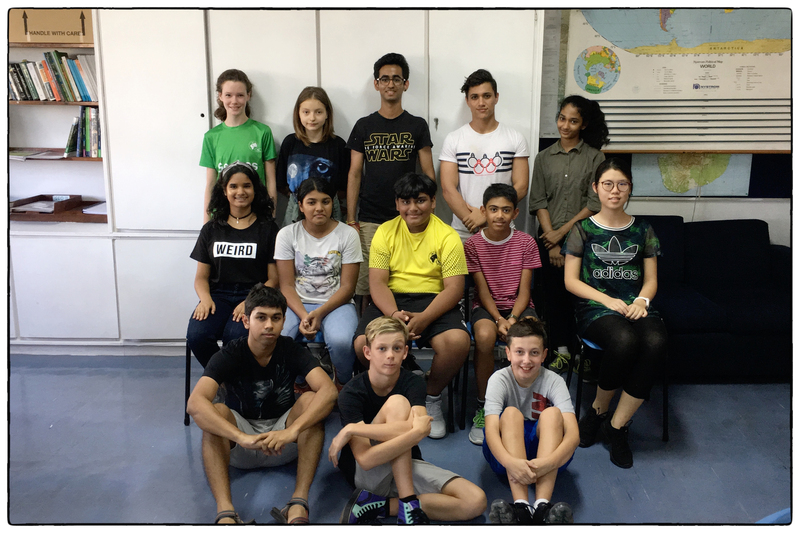 The 2018-19 Recycling & Sustainability service group at the beginning of the school year. 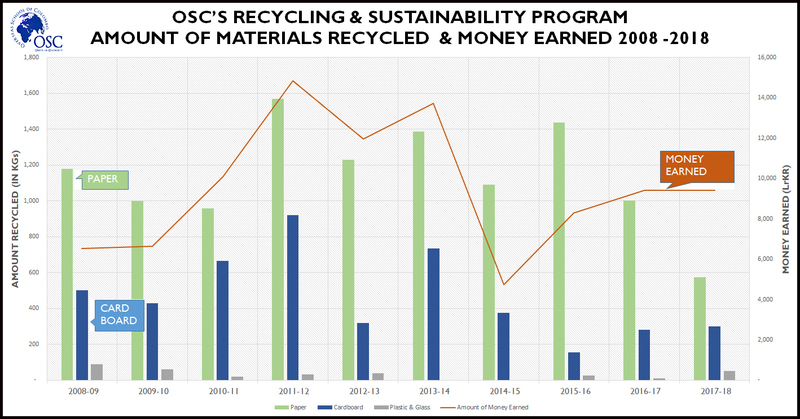 This year we have several goals for OSC’s Recycling & Sustainability group in the 2018-19 school year. Continue to pursue our mission statement of reducing the school’s ecological footprint through active recycling and information campaigns to help reduce consumption. Improve the process of waste segregation on campus. It is not working very well at the moment. Promote the composting of school garden waster through the in house design of a large leaf composter. Sponsor a 2nd annual Environment Day (scheduled for March 2019). Facilitate the installation and maintenance of a Biogas plant. The plant is being paid for with money that the R&S group raised through the sale of paper and cardboard over the last 13 years. 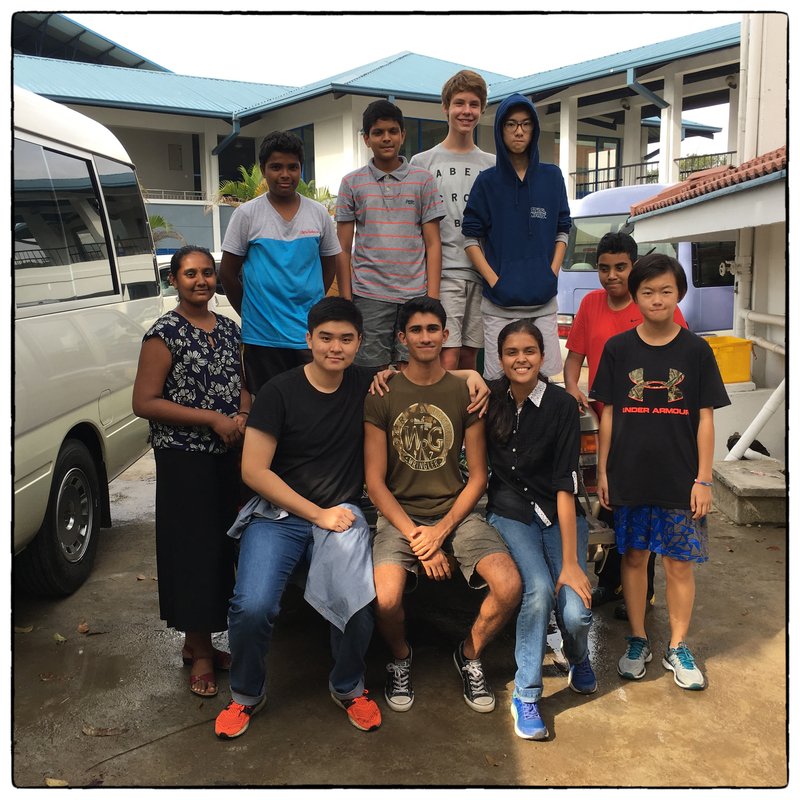 OSC student Disara Samayawardhena is helping and taking a personal lead in this enterprise. Work with other school collaborators on achieving our goals, namely the school maintenance department and the Reefkeepers service group. Promote the idea of installing solar photovoltaic panels on our roofs. This is a significant investment but we believe it will help make OSC a more sustainable campus and Ms. Chameela’s case study demonstrated that it both both economic sense and good for the environment. We are pushing the idea with the school board who commissioned a feasibility study in 2017-18. 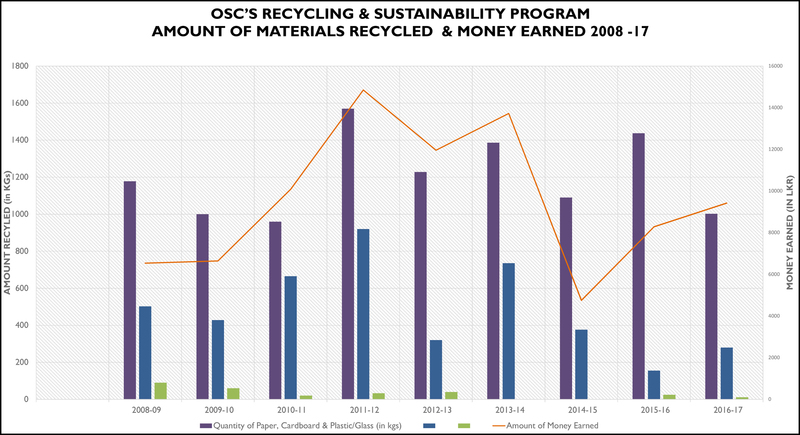 The following graph highlights amounts of paper, cardboard and plastic recycled by OSC’s recycling & sustainability service project between 2008 and 2017. These resources are collected and sorted by students during our Thursday afternoon service block. We then take them in the school pickup to our neighborhood scrap dealer where the paper and cardboard is sold and weighed. We also collect plastic, batteries, cartridges, but we do not get paid significantly for these. Glass and metals are also collected but our numbers are not significant. Prices for recycled paper and card board have roughly stayed the same during this period (1kg of card board sells for 10 LKR and 1 kg of mixed paper sells for 6 LKR). While we have been working to recycle more of our school’s waste, we are also concerned about consumption patterns and are working to educate the community about reducing these levels. Nevertheless, there is a general decline in paper being recycled (perhaps due to lower consumption patterns when the school moved to an electronic, 1:1 teaching & learning environment in 2014). This has been an important year in the work of the Recycling & Sustainability program. We had an infusion of new leadership in August and the new avatar Train to Sustain out a focus on bringing a wider circle of the community into the sustainability picture. This post is being published at the end of the school year as we look back at important landmarks and consider jobs that still need to be done in the future. The land slide at the Meethotamulla Dump Site was a major environmental disaster in our local area. The media coverage was quite comprehensive and there had been a good deal of self- reflection on the deeper causes that led to loss of lives and property. At the time of writing it, is still unsure if the country is going to adopt the kind of policies that will address the solid municipal waste (SMW) problem and tackle it with aggressive efforts to reduce, recycle or compost what is left over. At the school we made major headway with moving the cafeteria to be more sustainable. Significantly we eliminated all disposables: paper boxes, paper cubs, and finally straws. The credit for this is also due to the Canteen committee and Reefkepers who support the effort to eliminate disposables. The group continued to its weekly paper and cardboard collection and the results are shared above. This year we started to get paid higher rates when we delivered better segregated A4 paper and cardboard. Generally, the price was LKR 6 per kg but a few times we earned LKR 10 for paper and LKR 15 for cardboard. The school has a printing quote and we hypothesized that this has reduced overall consumption of paper. At this stage we can not comment on that since our data on paper purchased and consumed is incomplete. We continued to build our relationship with Viridis, the country’s leading plastic recycling. The DP Environmental Systems & Societies class and several recycling leaders took a field trip to their site. Later Viridis set up a PET bottle collection point at the school. We have extended the option of recycling plastic bottles for the whole OSC community. General awareness spreading in the community. Better use of the waste bins on campus. We have noted that, despite having three different bins, people are mixing what they throw away. Overall reduction in the amount of solid waste generated by OSC. Highlighting E-waste and doing a better job with recycling what we produce. DP1 ES&S lends a hand on the last day of school. Grade 5 students unloading paper at the Pelawatte scrap dealer. Getting the accounts and money earned- the 2nd highest amount in the whole year! Grade 5 collected paper from primary school and learned about what happens when we take it to the scrap dealer. Economic Benefits of Waste Management. Mirror Business. 2 May 2017. Web. Maligapse, Rajith. “Sri Lanka’s Waste (Mis) Management.” Roar. 18 May 2017. Web. Ravishan. “The Story Behind Our Solid Waste (Mis) Management.” Roar. 5 June 2017. Web. The Garbage Economy. LMD. Web. Weeraratne, Bilesha. “Pay as You Throw! A Solution to Sri Lanka’s Mounting Garbage Issue?” Talking Economics. 24 April 2017. Web. In the 2016-17 school year the OSC Recycling & Sustainability service group is once again taking on a range of environmental issues at the school. This is the 12th year of the service group and it continues to benefit from a clear mission to reduce the school’s ecological footprint and able student leadership facilitated by faculty guidance. Articles in the Colombo-based Sunday Times as well as globally-oriented Guardian frequently highlight this negative aspect of our consumer culture. The service group seeks to address these issues and work with other members of the community to reduce harmful activities and better inform the community about sustainable solutions. Our 2016-17 service leaders include Aashika Jain, Aryaman Satish and Sangmin Kim. See our Facebook page for more information on the Train to Sustain chapter.